Yes, you’re in the right place. Yes, it is citrus season. However, some of you know by now I tend to follow my stomach more than trends. Besides, isn’t the point of citrus to brighten up a gloomy winter’s day? I don’t consider overcast skies the real issue here in Southern California. It’s just cold, by our standards. Such temperatures call for a dessert that’s warm and comforting; and I don’t get that vibe from citrus. My thoughts turn to pie. Problem is, I’m limited by my condition. You see I suffer from FOPS (Fear of Pie Syndrome). Actually, it’s fear of making pie dough. I can’t tell you how many amazing recipes I’ve come across. Then, I see the section for pie crust, and my heart sinks. And let’s not even talk about the bean thing. I can’t close the page fast enough. Of course, I’ve pinned guides from trusted bloggers. Still, I wasn’t ready to go there. So, I took a baby step and chose cobbler, a Brown Sugar Apple Cobbler. And I do mean brown sugar. The apple filling alone had 1 1/2 cups, and another 1/2 cup was in the biscuit topping. It was ideal for a brown sugar lover. The first steps were easy. It was all about the filling. I used dark brown sugar instead of light. Otherwise, I followed the recipe until halfway through cooking the apple mixture. I had a hunch the tablespoon of cinnamon would be too spiced for me. It needed vanilla. Instinct said 1/2 TB. Upon adding the extract, an aromatic scent rose from the skillet, as if the apples gained new life. The result was a cinnamony sauce reminiscent of that in Cinnabon Rolls. Feeling more confident, I moved on to the biscuit topping, and prepared it exactly as instructed. Now I didn’t have a 3-quart dish as noted in the recipe. I was working with my 2-quart round Pyrex dish instead. Thus, my drops of dough over the cooked apples were larger than 2 TB. I placed a baking sheet in the oven underneath the dish if anything bubbled over, and adjusted the temperature to 375 degrees. Although the apple cobbler was in the oven, I wasn’t out of the woods yet. There was still the fear of doughiness. You know, everything looks good on top, but as you dig deeper it’s undercooked. For that reason, after 25 minutes, I inserted a tester deep into the topping to make sure it came out clean. And it did in more than one spot. 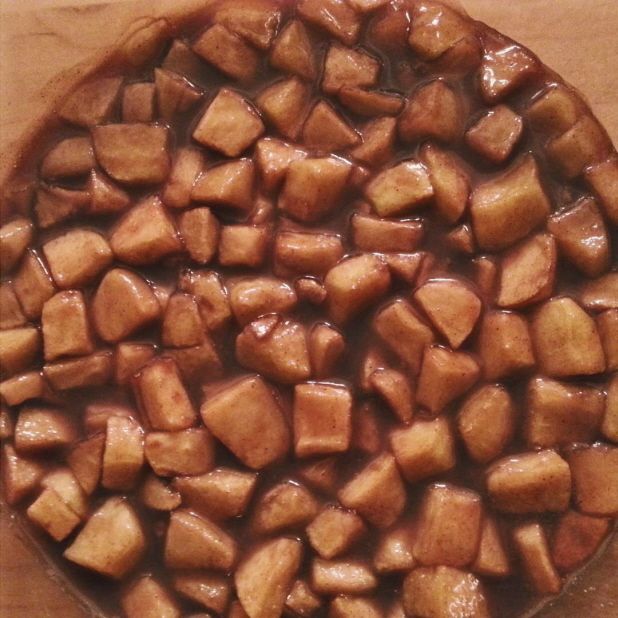 With a browned crust and bubbly filling, I set the Brown Sugar Apple Cobbler on a rack to cool. A while later, I noticed something most curious. The center had sunk. My brain was tired, so I didn’t try to figure out why. I just needed it to taste good. And indeed it did. 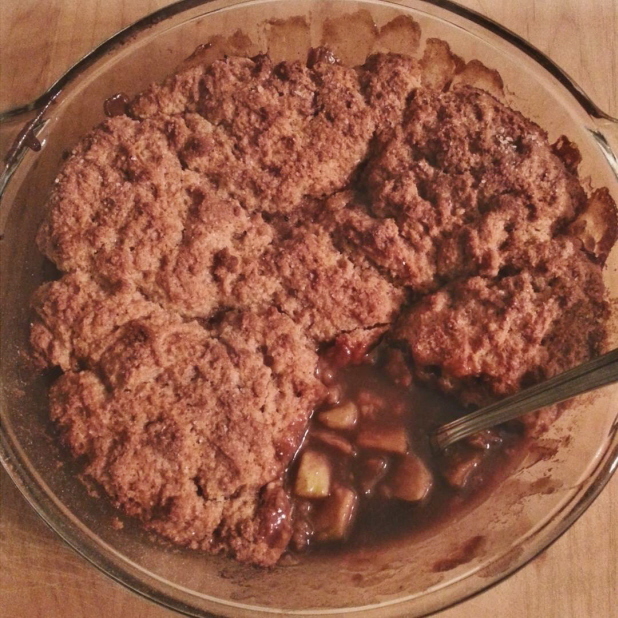 The brown sugar sauce was the star of this cobbler, and it enhanced every bite. The once tart Granny Smith apples surrendered to its brown sugar-cinnamon coat. They were just soft enough without being mushy. The biscuit crust had a lightly sugared exterior, moist interior, and a cookie-like flavor. It was sturdy enough to withstand a saucy bottom, and an extra spoonful served on top. I couldn’t resist the urge to have another piece. This time I wanted it a smidgen above room temperature. But the next helping revealed the reason for the sunken center – undercooked dough. How did I miss that during my spot testing? Disappointed with this turn of events, I tried to salvage the apple cobbler. I covered it with foil so the crust wouldn’t burn, and put it back in the oven. Naturally, this didn’t work. Whatever chemical reaction makes dough do its magic had already stopped. I only succeeded in thickening the brown sugar sauce. Now it was cinnamony, sweet, and gooey; even more like Cinnabon Rolls. I conceded to just remove any doughy parts, and enjoy my luscious cobbler. 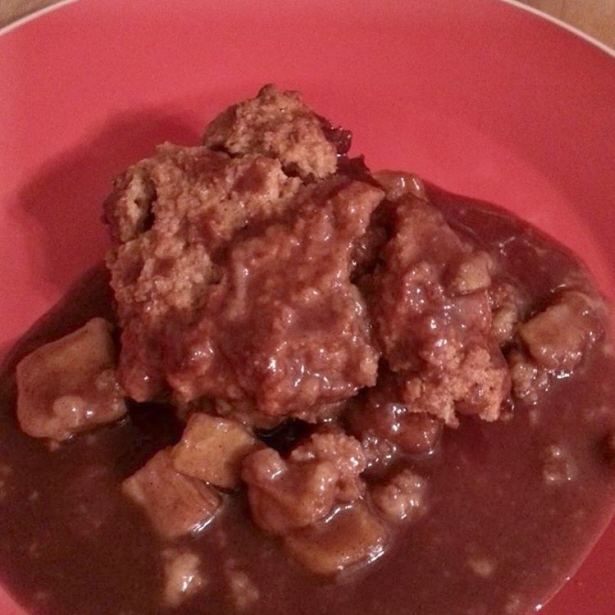 In spite of my outcome, I give this Brown Sugar Apple Cobbler 4.5 out of 5 stars. While not for anyone who finds some desserts too sugary, I adored it. I bet it would be great for peaches too. Next time around, I’ll use my rectangular 2-quart dish. That way the biscuit dough won’t be as thick. And, I’ll test every single patch before removing it from the oven. For the full recipe, please visit Bake or Break. Yes, I was drawn to the author’s original take on conventional cobbler, and I love it! Now that I’ve had it this way, I doubt I’ll look at cobbler the same.